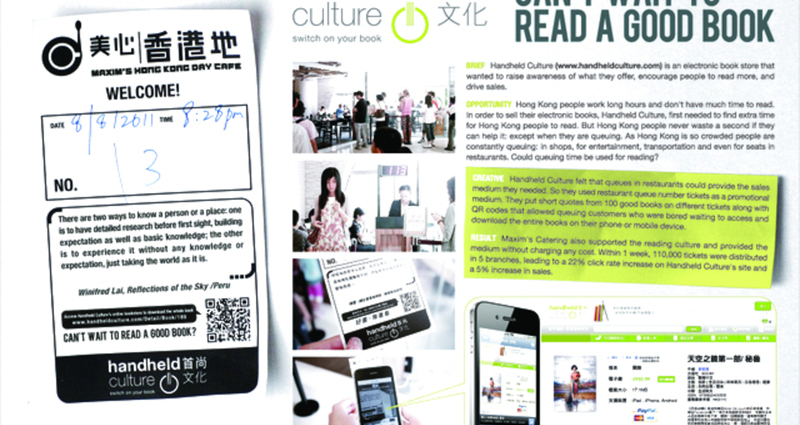 Our ambient + mobile campaign was designed to raise awareness of electronic book store Handheld Culture (www.handheldculture.com), and encourage people to read more ebooks. Hong Kong people never waste a second if they can help it: except when they are stuck in a queue. Hong Kong is a crowded place, so people are constantly queuing up in shops, for entertainment, transportation, and even for seats in restaurants. We recognized queues as an opportunity for Handheld Culture and decided to use restaurant "take a number" tickets as a new kind of promotional medium. We put short yet enticing excerpts from 100 good books on the tickets along with a QR code that allowed queuing customers to download an entire ebook onto their phone or mobile device to read while they waited. Within one week, 110,000 restaurant queue tickets were distributed, leading to a 22% increase in visits to Handheld Culture’s site and a 5% increase in sales. The Brand wanted to raise awareness of their ebook offerings, encourage people to read more, and drive sales. The idea relied on the penetration of QR reader technology. On average, Hong Kongers buy a new mobile phone every 1.5 years. Amid this culture of ever-upgrading mobile devices, and with more and more promotions coming from advertisers, QR technology is entering a mature stage in Hong Kong, which enabled.